If you need convincing that women can be just as derogatory, obtuse and vulgar as certain men can sometimes be, get your bottom down to the Pleasance Theatre in Islington and check out Posh, the phenomenal play by Laura Wade, now with an all female cast who display such misogyny like it’s the most natural thing in our messed up world. 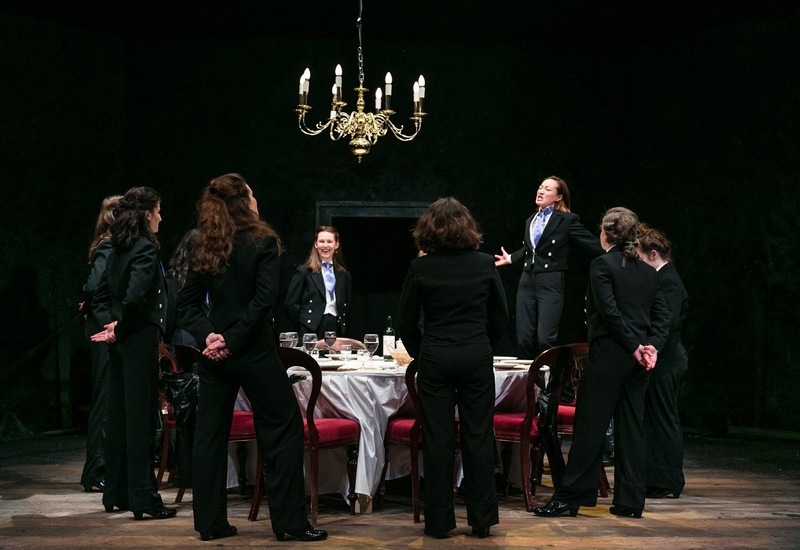 Guy (the eloquent Amani Zardoe) and Jeremy (Sarah Thom on fine aristocratic form) set the pompous scene as Godson and Godfather respectively, chatting away in the House of Lords about a dinner party that needs a little more oomph (complete with hip thrust) to propel Guy to presidential status of their university dining club known as The Riot Club. .
Current Riot Club president is James (Gabby Wong), the moral compass of the group even if he can down a bottle of wine. Then there is Verity Kirk’s quirky Ed, perhaps the most endearing of this group of twits. Kirk has the most incredible comic timing and displays an innocence that belies Ed’s drinking aptitude. It was a wonder that the rest of the group didn’t laugh at his inability to not say the first thing that pops into his wee head. Molly Hanson plays Toby, perhaps the only chap to give Ed the time of day outside the Riot Club dinner and who can not only not hold his liquor but does so in spectacular (and spooky) fashion. The show is full of commanding performances from the ten leads, though sometimes one needs to spend more time with a character, if only to make their later outbursts more transparent. All ten men think it right that they can act in this ridiculous and ridiculing manner, displaying the arrogance of that thought right upon the surface. Like the great politicians of… a while ago now, their personalities are only ever what’s expected, right down to Alistair’s incredible outburst concerning hating the poor and decrying the system which is perfect for his spiteful companions. His is the most heightened caricature here, played with relish by Serena Jennings, who Sarah Mills dresses in red chinos, no socks, and a blazer for the final scene back in Jeremy’s chamber. Daring director Cressida Carre takes her cast and gives them all the prominence their characters sorely desire, making excellent use of Sara Perks’ rotating stage and endless bottles of wine, quite a feat to orchestrate. Posh is a fabulous show full of characters you’ll love to hate and a chance to laugh at Oxford’s (ahem) finest before they take over the country. For this, so Wade illustrates, is the way of it.